My husband and I have escaped to the beach this week while my in-laws take care of our house and cat. So if you follow me on facebook, I might be sharing some fun things from our vacation in photos. Hoping to go home with a bunch of beach things (sand, shells, starfish, etc.) so I can add some beach goodness to our house when we get back. So in honor of our beach week this week, I thought I would have a beach week here at the blog too! 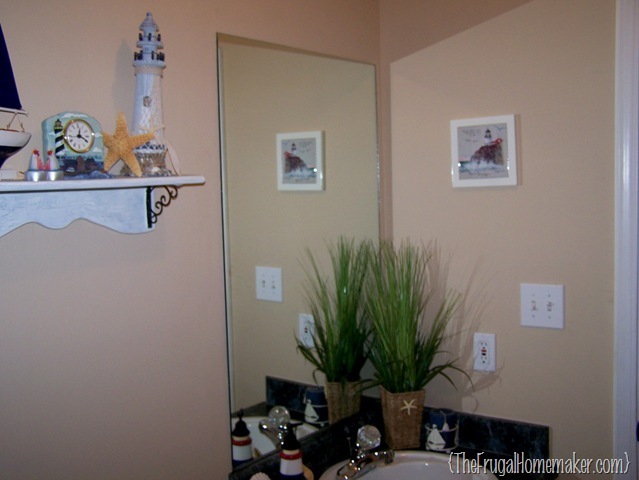 I actually already have some beach décor in my house – specifically in our spare/guest bathroom upstairs. So this bathroom is just a small 3-piece bathroom upstairs in our hallway in between the 3 bedrooms. 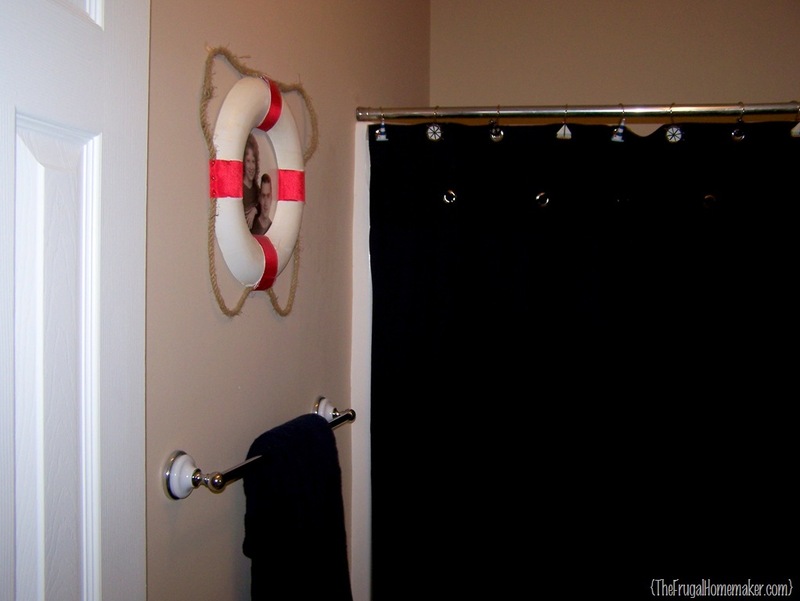 When we first got married, we got the shower curtain and some of the lighthouse/boat accessories as wedding gifts. 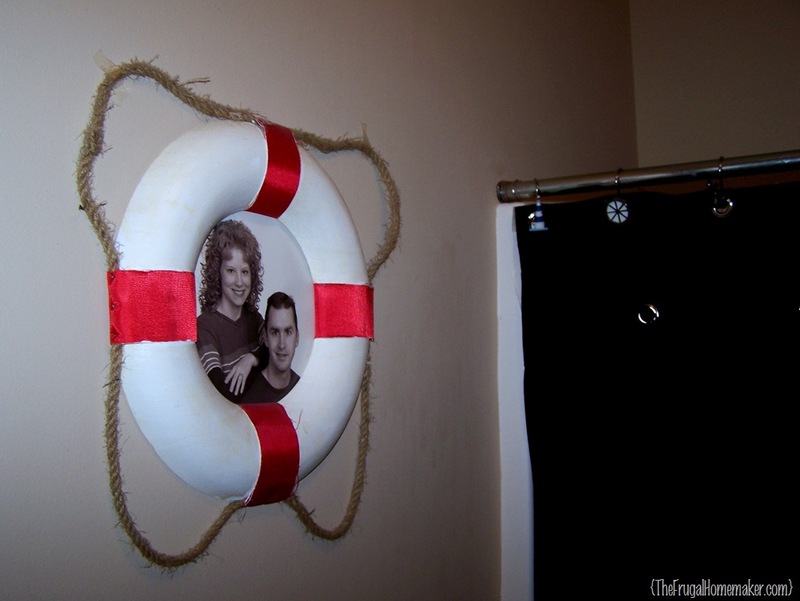 We used this in our one and only bathroom when we first got married and were renting a house in VA.
One of which was this life preserver serving as picture frame. I did this in VA when we had been married just a few months. The preserver is wood and came completely unpainted from Michael’s. 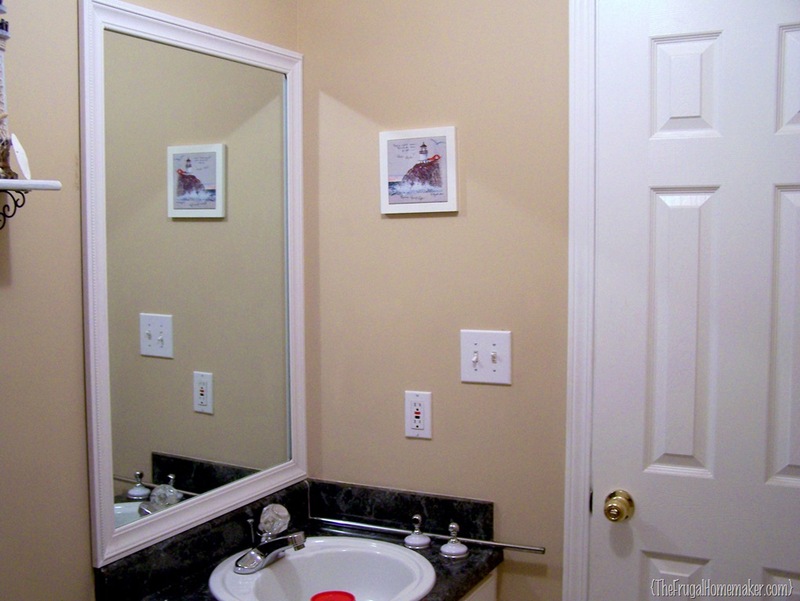 I painted it white and then added one of our engagement pictures taped on the back and had it hanging in our first bathroom. Here’s the other side of the bathroom with yet another one of my first DIY projects. This shelf came unfinished as well (maybe Michael’s too?) and I painted it and then did this crackle finish on it. (This was way before I had heard of glazing/distressing/or anything like that. Wow, how my world has changed in 9 years! ) 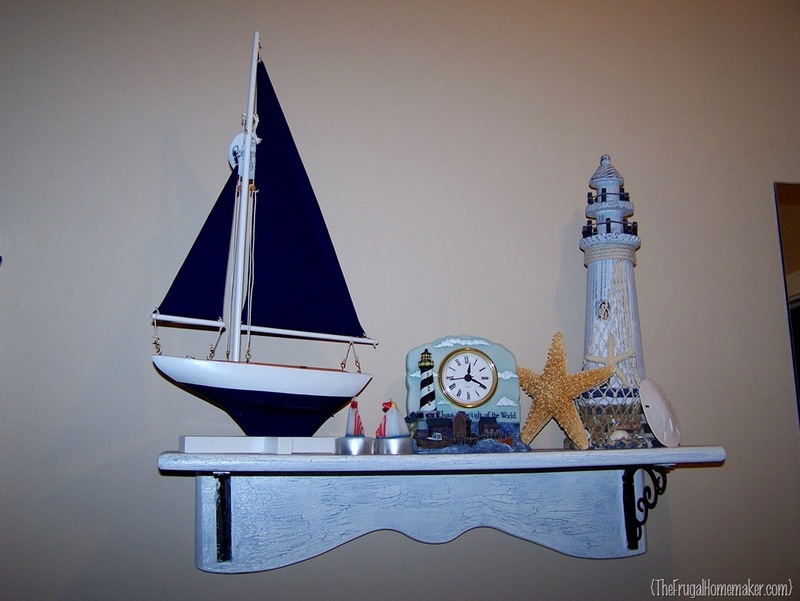 Some of the beach things we picked up after we moved back to GA and took our first beach vacation to Myrtle Beach quite a few years ago. I think I might have mentioned that I found the world of DIY/Home/Frugal Décor blogs in December of 2009. It was actually my friend Renee from Living, Laughing, and Loving that introduced me to Thrifty Décor Chick sometime that December. And I was HOOKED! I absolutely loved her blog and I think I read all the way back through her archives in the next few weeks. 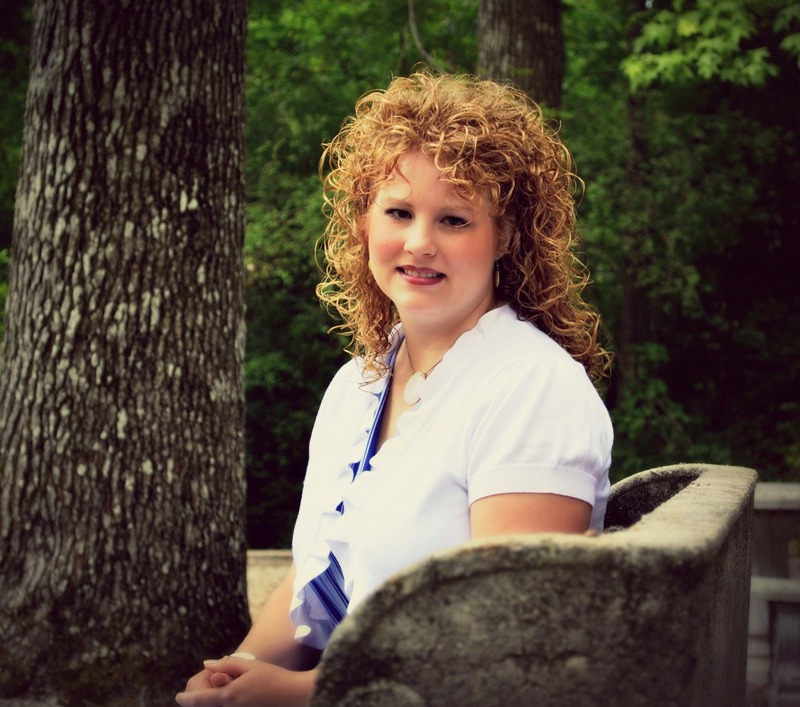 From her blog I found other blogs, and eventually decided to start my own blog! So it is all Renee’s and Sarah’s fault. So later that summer, I was inspired to makeover this bathroom. The first thing I wanted to do was frame in the mirror. If you have never seen this done before, there are TONS of tutorials and ways you can do this. 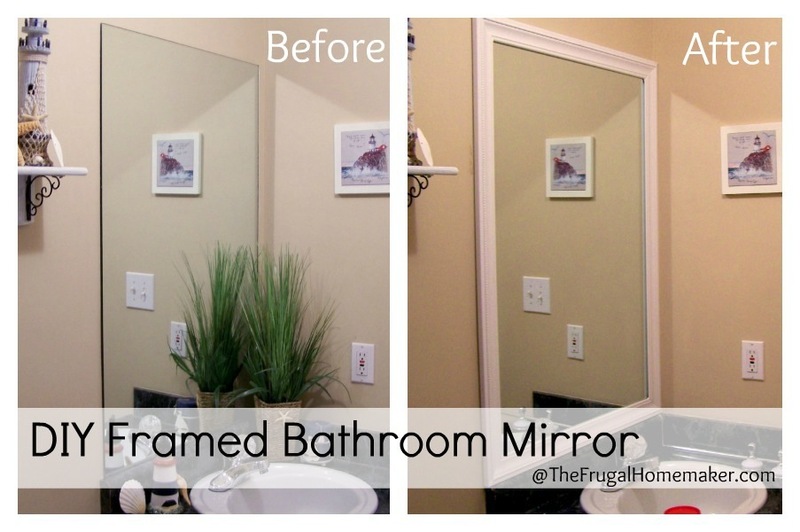 Just search “framed in mirror” on Pinterest for lots of ideas. 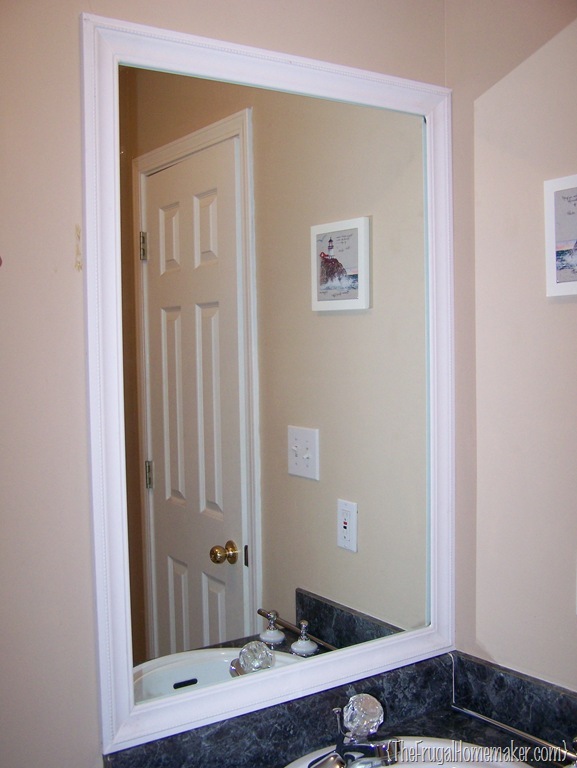 Or you can create a more craftsman style mirror here using MDF strips and molding to frame in the mirror. So once again, didn’t know then I would need all the details to blog about this so I will recount what I remember. 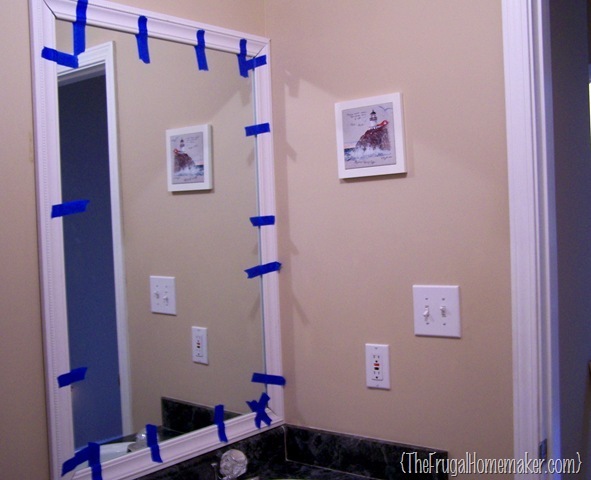 I measured my mirror, and headed to Home Depot to pick out some trim. I don’t even think we owned a miter sew then, so I was looking for something easy to cut in our miter box. I found some white finished trim that is made out of that plastic /hard foamy type of material. It is usually cheaper than buying wood trim too. And I picked up some mirror glue – like Mirror Mastic or liquid nails for mirrors. I can’t recall the price but I know the molding was not much – less than $1/foot and I needed about about 10-12 feet. 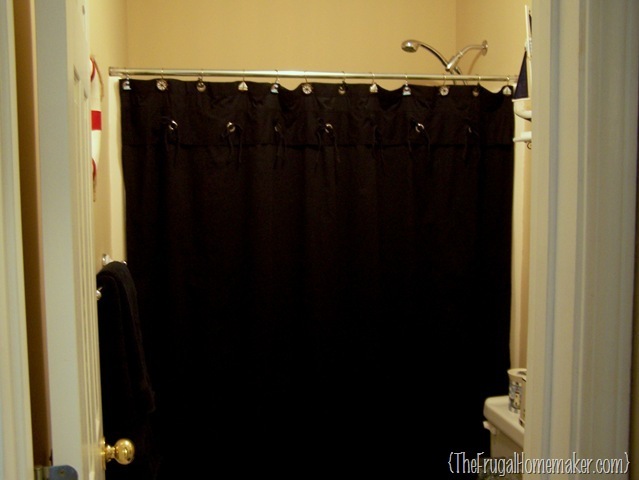 So it was around $10-12 for the trim – super cheap project with a HUGE impact. I measured and cut each piece at a 45 degree angle with my miter box. 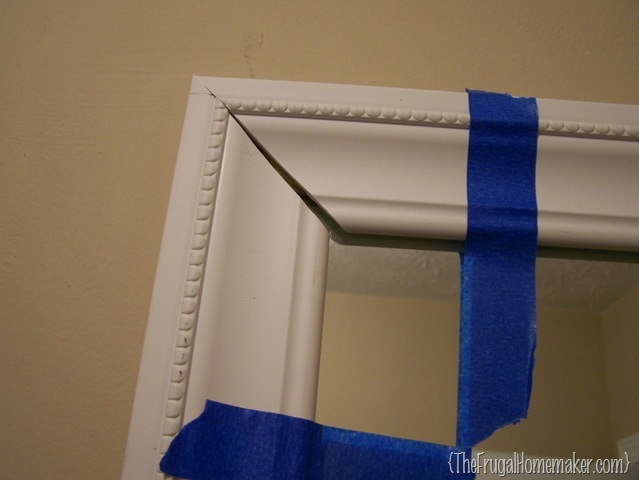 Your corners may not fit together exactly, but that is fine because caulk hides it all! 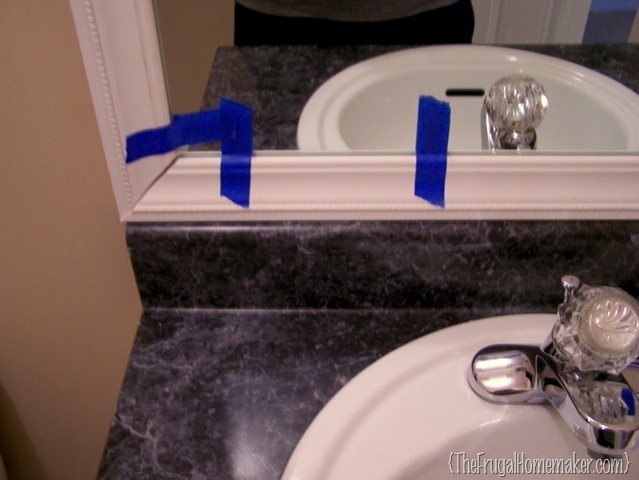 I applied the glue on the back and just stuck the trim pieces right to the mirror making sure to get them straight. The bottom piece I just placed right on top of the small laminate backsplash. I taped it all up with painter’s tape so it would stay perfectly still while I waited for the glue to dry. I don’t remember how long the glue was supposed to dry but I know I at least left it overnight or even a day or two. Here it is all caulked and painted. See, you can’t even tell there was gaps there! Here’s the before and after…. But I wasn’t done with my bathroom project yet –come back tomorrow to see what else I added to this bathroom! what a cool idea! Love how it turned out! Praying you have a much needed relaxing vacation! Love it!!! 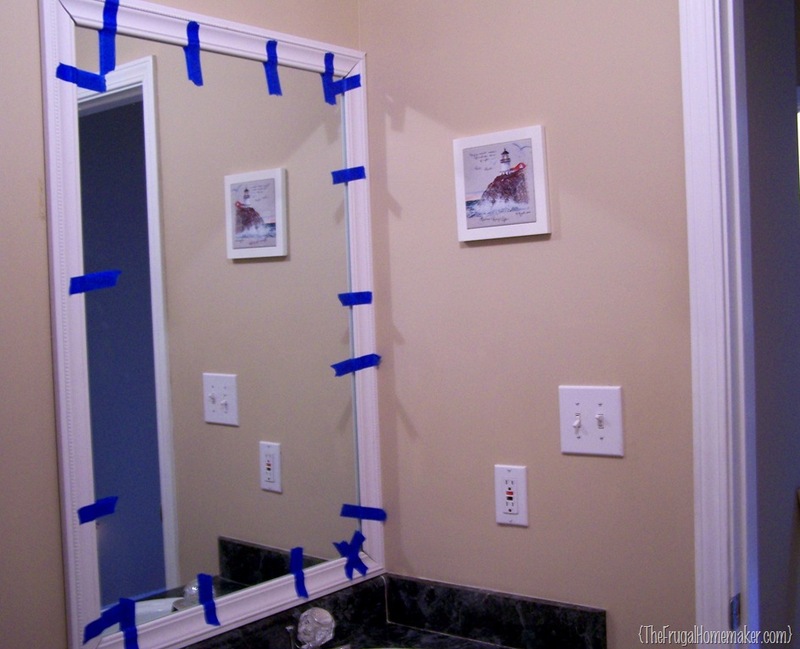 We have a HUGE mirror in our bathroom and I have been wanting to do this. I’ve wanted to do this for ever, but just can’t figure out what kind of style. 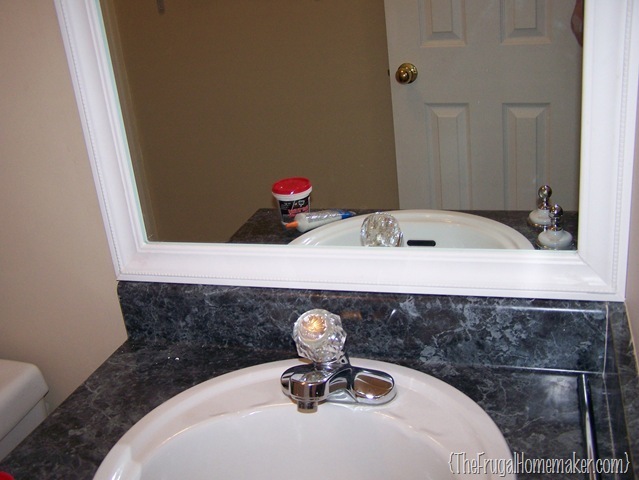 I have natural wood cabinets and molding, but I don’t think I want to add more with the mirror. I’m thinking white too, but I just can’t picture it. Did you paint the glass edge on the side? 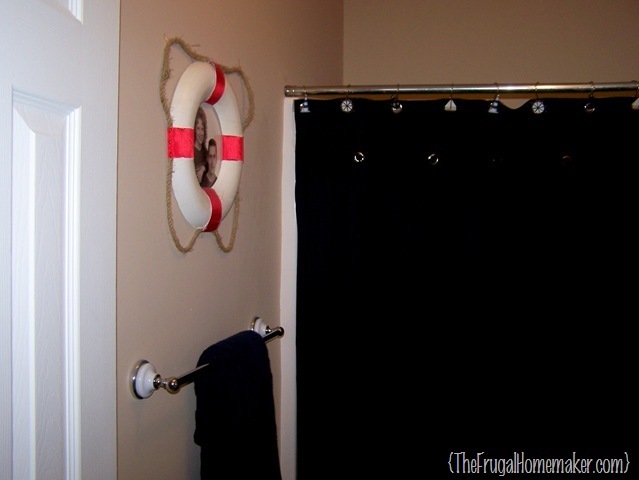 I’ve seen a couple of these done, too, but yours looks so easy & cheap! Thanks for the tips, I have 3 large mirrors in 3 different bathrooms that are not framed and I do want to get it done one day. I’m pinning your post for when I finally get around to doing something about them. Debbie recently posted..Blooms, Blooms and More Blooms! Hi. 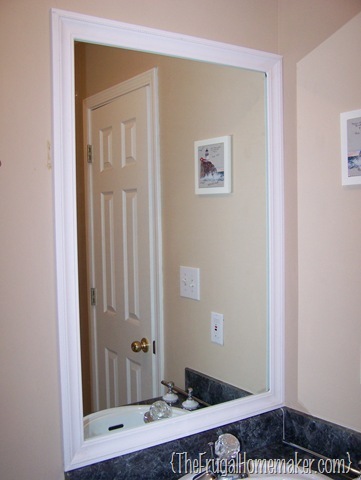 Your bathroom mirror with frame looks very nice. 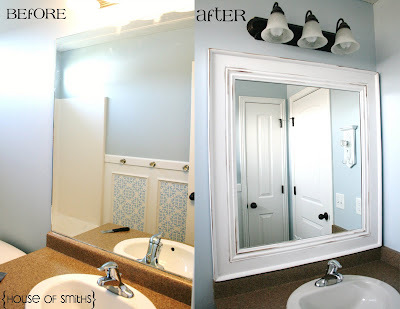 I’m planning to do the same on my powder room. Did you glue the frame on top the mirror or on the wall? 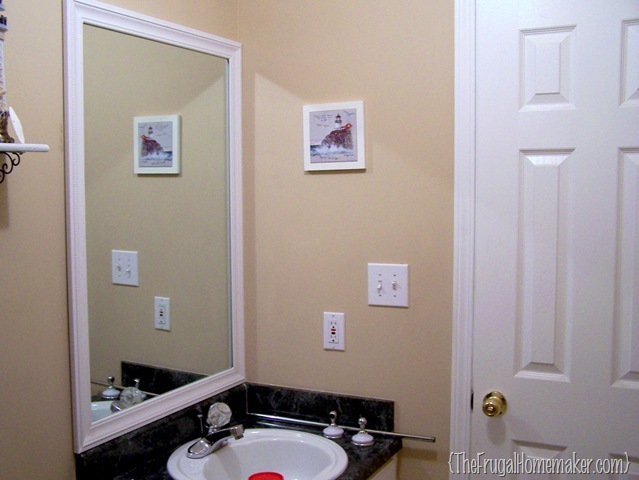 Is the side of the mirror showing?